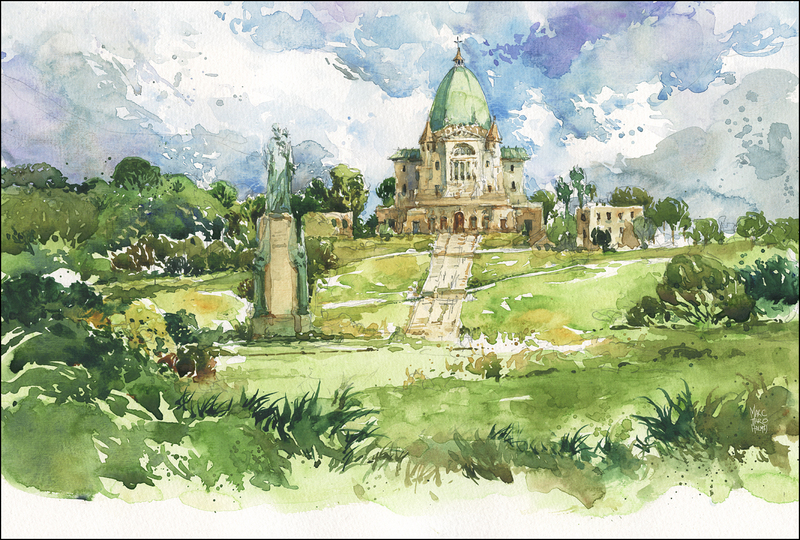 One can’t help but notice the Oratory – it’s positioned on the crest of Mount Royal, above a rolling lawn and series of wide steps. The enormous copper dome is visible from almost any part of the west island. It’s somewhat of an optical illusion. There’s a trick of scale between the dome and the massive pillars at the entrance – at first it looks likes any old chapel on the hill – but if you begin the climb up the steps, you quickly realize just how gigantic it is. This particular sketch led to a new thing for me. 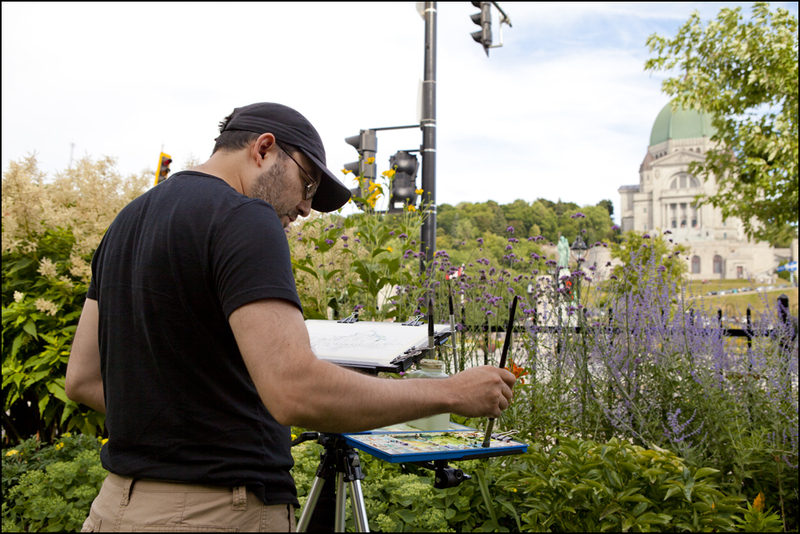 I made a painting on location, as I normally do. Sketching rapidly, and painting with energetic washes. After bringing it home, I couldn’t shake the feeling I had *still* not captured the scope. 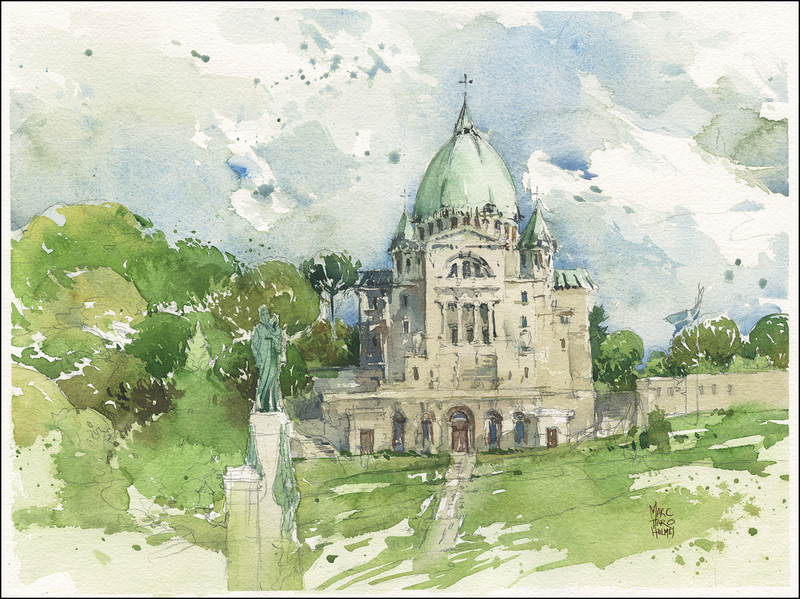 The impression of the Oratory is not just the building itself – but the whole effect of its placement on a hill high above you, and the vast manicured lawns and gardens. So, I did something I’ve never done – (though I’ve been wanting to try this for a while). Instead of going back on location for a re-take, I started again in the studio. Re-drawing the sketch entirely, taking more care planning the composition, and more time with the calligraphy of brushwork. This new piece is about 5 hours, so twice the time spent on location, and has the benefit of studio comforts. (Not worrying about light, weather or sore feet!). Overall, I’m excited about this process. I never want my work to stiffen up. It’s always a worry that being too comfortable, or using memory aids like photography or tools like a hair dryer (to speed up washes drying) – that these things might change the work. But I like what’s happening here – I think it still has the living feeling I look for. I like both! the live one is also special. 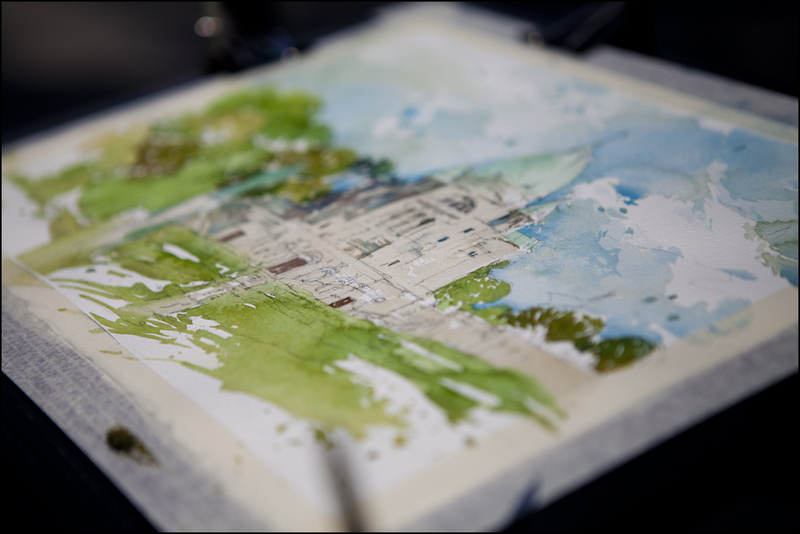 I STILL have easel envy…. and now hair dryer envy, too. That studio one is spectacular! Nothing to apologize for in the studio version, in fact I think it’s better! Both of this year’s versions convey the imposing height of the place better than your previous one, andI think in the studio version you were able to say more about what it really feels like to be there.And it certainly isn’t tight at all!